Have you ever wished you could bring your child to a concert or music festival? What about a NASCAR race, or a football game? Thunderplugs Babymuffs can protect your baby's hearing from dangerous or distressing loud noises, so you can spend less time worrying about those little ears, and more time dancing together by the stage. 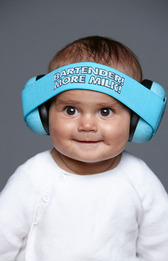 Thunderplugs Babymuffs were created just for babies and toddlers up to 3 years old. The key is the horizontal headband. It was developed especially for very young childen, so that the headband falls snugly across the forehead to hold the ear caps in place. The pressure is adjustable so you can get the perfect secure, gentle fit for your baby. Nothing contacts the top of your baby's head, so there is zero pressure on the top of the skull. With 27dB of noise reduction, Babymuffs provide very good protection from sound and are appropriate for a wide range of applications, from live music, to travel, to fireworks shows. A quick rinse with lukewarm water will keep the earmuffs clean between uses. Babymuffs have been certified and tested according to the EN norm, and meet all EU safety and quality requirements. Blue text reads: Bartender! More milk! For older children, Thunderplugs recommends their Bananamuffs Child Earmuffs for kids ages 3 and up.